I have a secret to share with you… I have a mysterious bag living in my freezer – my private stash. Every day I add a little something to it and hide it back away. It’s not what you think. It’s bones. 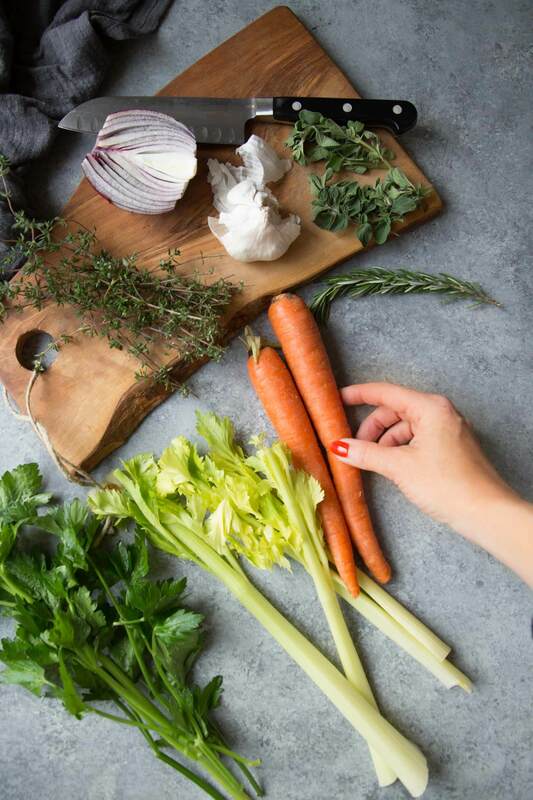 Chicken bones, beef bones, onion peels, carrot peelings, parsley bits, and celery ends… What normally would be tossed into the garbage is everything you need for a great bone broth in your slow cooker. Here in Portland, we recently got our first bone broth bar, Jola Cafe. Like you would with coffee or tea, you can customize your cup, but instead of milk and sugar, seasonings like smoked paprika, garam masala, nutmeg, tabasco, chili oil, and sriracha are added from the self-serve bar. I love that there’s the option to pick up a cup of this healthy bone broth on the go. However, I prefer to make my bone broth at home, in the slow cooker. It’s so easy and SO much cheaper. When roasting a chicken, braising short ribs, chopping vegetables, and scrambling eggs throughout the week, add those bones, scraps and (rinsed) eggshells to a large ziploc bag in your freezer. When your baggie is full, empty it into your slow cooker, add water to cover and add a good glug of apple cider vinegar. The vinegar helps pull the nutrients out of the bones, but don’t worry, you won’t taste it. What if Bone Broth Doesn’t Gel? I like to enjoy my slow cooker bone broth straight up, in the late morning and late afternoon, like a savory cup of tea. Your slow cooker will provide you with about 4 quarts of broth. It will keep in the fridge for up to five days. You can also use bone broth in recipes, swap it in for any recipe that calls for broth or stock. 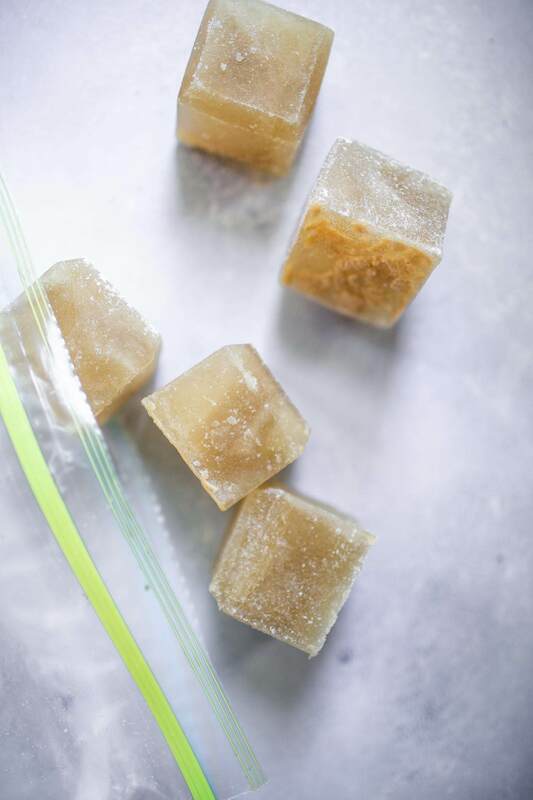 For longer storage, I like to freeze my bone broth in these silicone ice cube molds. Once the cubes are frozen, I package them up in a large ziploc bag. Each cube is about 1/3 cup of broth. 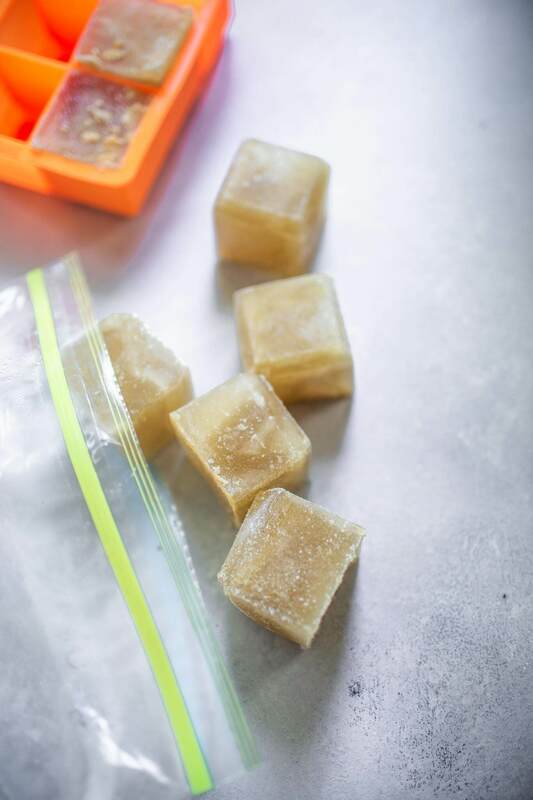 If I need to thaw some bone broth quickly, it’s easy to just pop a few of these cubes into a small saucepan or into a microwave to thaw them quickly. It’s much faster than thawing an entire mason jar of bone broth. 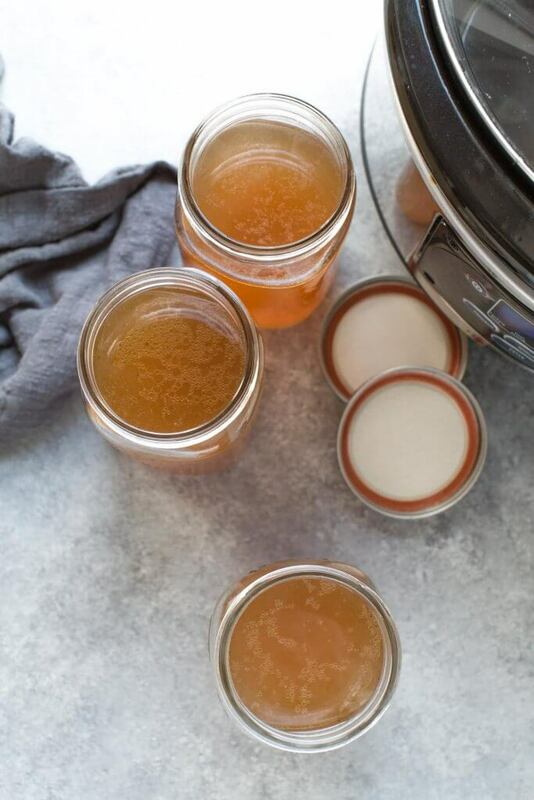 This Slow Cooker "Better Than Botox" Bone Broth is full of natural collagen! Make chicken, pork or beef stock using kitchen scraps and this simple crockpot method. 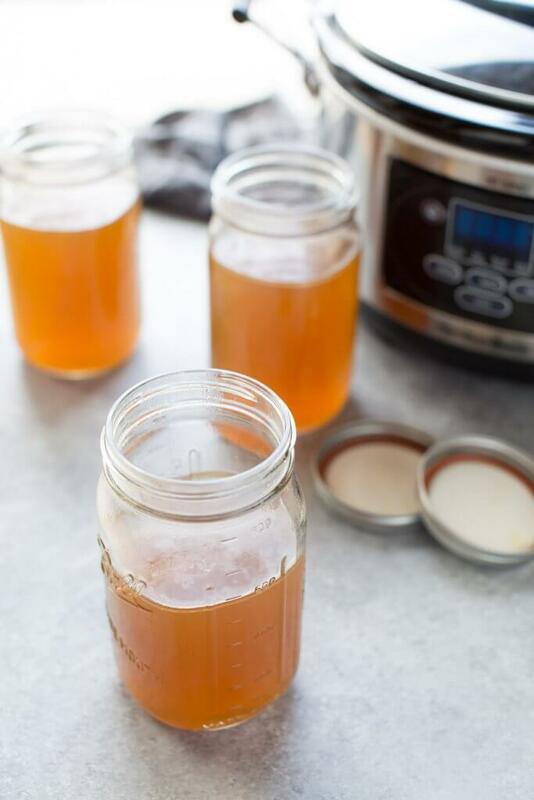 Want to make bone broth even faster? Try this Instant Pot Bone Broth recipe too. This recipe was originally published in February 2015. It was revised in December 2017 to update the photographs and refresh the content, and again in March 2019 to add an instructional video. The delicious recipe for Slow Cooker Bone Broth remains the same. Thanx for the idea. I am making my own stock for years, but I never thought about doing it in the slow cooker. I also like the idea of using the celery and carrot ends! Hi Sharon – You definitely can use those bones! I don’t cook meat with bones, so where and which type of bones should I buy? Absolutely. I take all my left over bones and veggie ends. However I’ve added asparagus to mine, bc it is an awesome detoxifier. Bones can be chicken, turkey, pork, beef, fish and pretty much anything else. There are some variations one might make depending on the bone type but a simple goodle search will take care of that. Fish is the only one I do differently. Ideally use organic bones, none organic animals are often fed GMO feed and traces stay in the fat. On a side note, I leave the fat that’s on the top, it’s a very healthy fats and healthy fats are good for us. You can buy them at the grocery store. You can buy butcher bones in the meat market. Cheap and great for bone broth. Ideally, the bones you use for any bone broth should be grass fed and grass finished….at the very least grass fed/organic grain finished. They are the healthiest for you because as the saying goes…you are what you eat. Chickens intuitively know what they need in their diet to be healthy and when they are free to roam and forage they are the healthiest for us, as are their eggs. Compare the color of the yolks from grass fed/grass finished eggs to “free range, housed organic and factory raised eggs and you’ll see the difference. They are more orange and contain higher levels of omegas! I have a really good butcher shop that I buy from when I want to make really nice stake or pot roast. Every time I go in there I buy a bag of soup bones. They are usually frozen and cost about 5$ a pound. I toss them in my deep freeze and use as needed. You can get soup bones from the butcher counter at the grocery store but I find that they are super small and way over priced. I’ve also found soup bones at my local Rancho Market. Is it ok to leave the slow cooker on low for 72 hours? I usually do 35-40 hours and it’s fine. I almost added eggshells to my bone broth, but was worried they wouldn’t dissolve and small pieces would get in my broth. Can you tell me how the shells break down, and what the benefits are? Eggshells are composed of calcium carbonate, thus they are a good source of calcium. The vinegar you add to the pot is what actually breaks down the egg shells. The acetic acid in the vinegar reacts with the calcium carbonate to make free calcium, water and carbon dioxide. By heating your broth, you speed up the reaction so by cooking your broth for the length of time required by this recipe, I wouldn’t be surprised if your shells had completely dissolved by the time you go to strain it. If you’re concerned, just add a little more vinegar to the pot, that should do the trick! Hi Sheri – I think that leaving the top ajar is the issue. That’s probably why the liquid evaporated. The lid should be fully on. Egg shells are comprised of calcium carbonate, thus they are an excellent source of calcium. The vinegar used in the recipe contains acetic acid which reacts with the calcium carbonate to break down the shells and release the calcium into the broth. Adding heat to a reaction like this can help speed it up, so I wouldn’t be surprised if your egg shells had completely dissolved when you went to filter your broth at the end. If you are concerned about them not dissolving completely, just add a little more vinegar. I don’t think they are meant to break down, after your cooking process is done you should pour broth through a fine mesh strainer or sieve. This will remove all the bits of food/egg shell/vegetable skins etc. Stacy you strain your broth to get the eggshells out. Yes. I’ve done successfully with no problem. Makes the house smell great in anticipation of consuming the final broth. Why discard the fat? That’s blasphemy!! It’s a waste. Freeze it and use it to cook with in place of oils. It has much more flavor. Thanks for that tip Don! Great info! Thank-you…..I simmered 3 chicken carcasses over 48 hrs and the stock has no gelatin….and is a bit bitter and darker. I read I over boiled it? Is this bad to eat or still nurtitious and just bad tasting? I am trying to heal my gut issues naturally. Thanks!!!! Use low heat. Simmer but do not boil. And I think maybe 48 hours was too long. I’m still working this our…was told by a butcher…a SIBO sufferer, 4 hours was sufficient for chicken. I’m going for around 12 right now for chicken but 24 for beef bones. How long does the fat lady refrigerated? I agree! But you can cook with it, and contrary to what most people believe, fat is good for you, don’t take it out, it’s the healthiest part! Someone mentioned pressure cooker. High/low pressure? And for how long? I cant wait to try this. I just got back from the store and I dont want to wait for 3 days in crock pot. Here is the link to make this in the pressure cooker. I am going to start doing this now! Long time back I read about a similar technique in martha stewart and I started making my own stash but I totally forgot and ended up throwing it hehe! But Thanks for reminding how easy and useful this is! Why strain, is it necessary? Thanks…have had the crockpot on all nite and everything smells great! You need to strain to get the bones & vegetable bits out. Thank God I found this post! I recently got shot from my man for regularly leaving the stove on for 3 days. I told him its to create this delicious and healthy broth that you can’t get if you just boil bones for a couple hours or so. He’s not convinced that the health benefits outweigh the cost of electricity that it takes to run the stove that long lol. Thank you for solving my dilemma! Use the slow cooker. Duh! Thanks for posting! was featured on Dr. Oz,,,bones alone give you amazing health benefits but of course including veggies etc makes it tastier. I would definitely do this, but without the scraps of egg shells. I like using beef boullion cubes or 1/2 of one in hot water when I get hungry between meals. Much healthier to make your own, tastes a million times better and you actually feel better to. Far too much salt in processed cubes. Enjoy! The cubes totally defeat the purpose. It’s not broth for taste or soup, it’s an elixir of nutrients for your health.. full the minerals, vitamins etc. Cubes are full of preservatives and sodium which are unhealthy. They are a cheat sheet for added flavor when making soup but bone broth is a completely different philosophy. My bf had a hard time understanding this. He was like “why would you make that” “that’s not how you make beef broth” “sounds disgusting.” So I sent him oodles of info on its benefits and he finally got it. We use one full beef knuckle from the butcher. Works great. My hubby is the same except he won’t let me keep the gas stove on overnight🤪. I’ll be using the slow cooker now! I’ve been making bone broth for years. I have my slow cooker going every Saturday and I usually don’t even get a chance to put the broth in the freezer because we use it up so quickly during the week. I love the idea of adding the scraps and bones in a freezer bag. What a great tip! I never thought of adding egg shells. I’ll have to add that to my pot next time around. I was lucky enough to receive some homemade bone broth and I agree, it’s divine. The flavor is so rich there’s really no way to describe it, you just have to try it. I made a simple stew with it as the base, added chicken thighs, carrots and rice. A bit of Dijon mustard in the stew pairs wonderfully and adds a unique undertone. Thanks for the post on how to make it! Matt – The stew with mustard added in sounds wonderful! I will have to try the mustard. Thanks for the tip! Did u use the chicken broth for the chicken stew? I make broth all of the time, (it is even better since the store started carrying calves’ feet; I like the pieces that stop at the ‘ankle’ for esthetics – perfect gel), but thanks for the tip of storing the assorted bits in the freezer and adding the egg shells! I love ideas that take the workload off of my brain. Could you use pork bones? Yes – You could absolutely use pork bones for your broth. Sounds great! M freezer looks similar! I love making slow cooker bone broth, chicken stock and seafood stock. Waste not, want not. Not a dumb question at all Alicia! You can either use bones from a leftover chicken or roast. Or, you can ask your butcher if they carry bones. My local market has the bones in the refrigerated pet section. Hope that helps! I’m reading about bone broth, and noticing that you’re saying it’s ok to use cooked bones… But the other places I’ve read about it it, say to use raw bones, otherwise all you get is “stock”. ?? Hi Jodi – Actually, roasted bones lend more flavor to the broth. Raw bones are perfectly fine to use as well though! You can also buy pork neck bones in your meat section at your local grocery store. They make great broth. Of course you cook the neck bones in a pot of pinto beans to get the meat off of them first. My mother in law used to make neck bones during WWII in a pot. My husband loved it. I’ll have to ask him how she made them. I went tot he butchers section at mu local morrissons in london and they do carry bones! nice surrprise. Would it make a better broth if the butcher cut the bones into smaller pieces? Hi Barbara – I don’t believe the size of the meat matters. If you cook it long enough, you should get all of the nutrients and flavors from the meat. However, it may cook faster if you use smaller pieces. I have been thinking about making bone broth for quite some time. The idea started when I was doing the Keto diet. Now I am trying out an anti-inflammatory way of eating, and iron chef Michael Simon mentioned that , while doing this plan he has been incorporating bone broth into his eating plan daily. I don’t have much information to speak of, but in knowing that most diseases iand ailments are caused by inflammation, I have decided to try this out. Per your question, I spoke with my butcher today and asked which bones to use and he said that Marrow bones would be excellent. Unfortunately, they didn’t have any so I bought some neckbones and beef shank. He said that since the beef neck bones were cut up a little smaller, they’d have more exposed marrow. There’s a lot of meat on there and I was thinking of making a borscht with some broth. I’ve been cooking this on low for 5hrs, 40 min. I just realized that I had saved frozen chicken wing tips to use for stock. Should I throw them in? Is leaving a crockpot on low a safe temperature for the bones or meat to stay untainted for 72 hours? Honestly, my house is like an icebox so I don’t fret too much, just have never tried this. do you roast raw bones first? Hi John – If you have bones that have been roasted, by all means, use those. They give the broth a richer flavor. However, you can also throw raw bones into the slow cooker and get a great flavor as well. Do I need to go to lowest temp on slow cooker after cooking for over 12 hours on 10 hour temp? There is one below called warm, am I safe to put broth on this for about 12 or so hours? you say to cook for 18 to 72 hours that is a big difference. So for a medium size crock pot full how long would you say? Hi Debbie! The longer you let things cook together, the more intense the flavor. However, you’ll still get great flavor with just 18 hours. The time is up to you. Hope this helps! I have stoped eating meats raised on grains, with growth harmones & antibiotics. I buy pasure raised meats, (chicken, & wild caught fish) & eggs. Where can I get “organic” bones? Because if they are not born & raised organic, the harmones/antibotics are in the supermarket bones. I buy my organic, hormone/antibiotic-free bones online. I usually substitute bison broth for beef broth, so when I need bones for bison broth, I order them from http://www.wildideabuffalo.com If you prefer beef bones, you can just type “organic beef bones” into google and pick whichever online merchant appeals to you most. I throw all my organic bones in the pot with everything else. I also have the butcher cut up my venison (deer) neck and ribs etc. and throw in with everything else. I have not chemicals on my land and many deer because it joins the Fed. parkway. For those who know nothing about deer…it is naturally low in fat and very healthy. Never knew what to do with the bones until now! Tastes GREAT! I have made my own broth for years but I have never used egg shells. What do the egg shells add? Hi Sheri – The egg shells help to add some additional calcium and minerals to the broth. Can I ask what the best way is to reheat the broth. Hi Phil! You can simply reheat in the microwave, or on the stovetop if you prefer. just made it!! cooked it 24 hours. didn’t strain it, cooled it and took all the fat off, then we ate it like a soup!! Awesome – I’m so happy to hear the feedback Carole. Cheers! Microwaves kill all good nutrients!!!!!!! Microwave does not kill nutrients. First of all, nutrients aren’t alive. Secondly, the original “microwave kills” study was flawed. The study “boiled” broccoli in water in the microwave then tested the nutritional value of the broccoli after removing it from the water. The nutrients had transferred to the water out of the broccoli. This happens when food is boiled whether it is in the microwave or on the stovetop. Steaming and microwave cooking are actually the best cooking methods to retain nutrients in food. A quick google search will provide you with more scientific information on this. Also heating food in general can can break down (some) nutrients. The good thing about the microwave is it actually reduces heating time meaning less heat and a lower rate of broken down nutrients. You need to figure out how to distinguish between science-based information and misinformation. The cited article has absolutely no links to anything. For all we know the author could have made it all up. Should the slow cooker be on high? I started my first batch at 3pm on high and its boiling. Hi Angie – It’s best to cook the bone broth at low heat if you plan on cooking it for the time recommended. Hi Denise – This bone broth really does aid with your skin because it is full of collagen and nutrients. However, I’m definitely not a doctor, or even a health specialist, so I can’t account for how much you would really need to drink to see a difference. My motto is – Everything in moderation. I enjoy drinking the broth to help to get some of those nutrients that may be lacking in other areas of my diet. Hope this helps! Denise, it’s the chicken stalk that is making your fingers swollen, it has a lot of salt, even the low sodium ones have a lot, you do not need to add stalk to your broth, only water. I haven’t done a lot of research on microwaves myself, but a science fair display at my son’s school stuck with me. The student had taken six houseplants and watered them equally with tap water for the first three, and with microwaved tap water (that had been cooled back to room temperature) for the other three. The tap water plants looked fine and healthy, and the microwaved water plants were absolutely wretched. Either way, it’s safe to say there’s no harm in slowly reheating it on the stove, so why not just do it that way? It really doesn’t take that long. Can you also use pork bones for the broth, or ONLY chicken and beef? Hi D’Anna – You can definitely use pork bones. Any bones you have on hand should work great. I think the pork would be AMAZING! I’d love to hear back on how it turns out! 1. Should the bones be uncooked / raw, or cooked ones? 2. I don’t have a slow cooker, so how long should I cook this on low heat in a regular pot, after bringing it to a full boil? IHope to hear a respond on this. Hi Linda – You can use cooked or uncooked bones. Cooked will have some more flavor, but uncooked work just as well. After bringing to a boil, I would let this simmer for at least 4 hours on low heat. I hope this helps! You can use an electric pressure cooker also. I pressure for an 1 1/2 hours then cool and check if the bones are not a little brittle where a fork goes in I add more water and pressure again for 1 1/2 hours. After I get the results I want from the bones I add my vegetable and cook then eat. I will be adding some vegetables now when starting. I am giving the brittle squashed strained bones to my dogs in their food with some water. They love it also. You can preserve by canning in pint or quart jars if you are not going to use immediately or have a lot. The reason you don’t want to give the cooked bones to pets is because they splinter and tear their intestines up, which can be fatal. Raw bones are not as brittle. Sorry, but I forgot to ask you two more questions. 1. In the instruction, you say to chop the vegetables, AND the garlic…the garlis isn’t among the ingredients. So I’m wondering if there should be garlic included, and if so…how many cloves? 2. After filling jars with this broth, how long does it last in the fridge? Hi Linda – Thank you for catching that! I amended the instructions to include the garlic (2 cloves). However, it is optional. Feel free to use as much or as little as you would like. In the fridge, the broth should last up to 5 days. If you’d like to store it for longer, I’d suggest freezing it. It will last in the freezer for up to 6 months. However, if freezing in mason jars, be sure to leave space in the jar, so that the jar does not crack. You are giving your dog cooked bones? Madness. My dogs eat raw bones but cooked bones can be deadly. Please don’t do that. My dogs get bone broth every day. I also make it in my InstantPot. My Terrier has an old hunting injury and it hasn’t bothered her since starting the bone broth. If only I ate as well as my dogs ! Just make sure if you’re giving it to dogs to not use onions or garlic… that’s toxic for dogs. Pressure cooked bones do not splinter. I know a guy that has been feeding them to his 2 boxers for 15+ years and they’re fine. They basically just crush up and dissolve. So after you made the broth, what are the best way to use in drinks? Any good recipes. Thank, ready to try. Hi Corita – I just drink this straight up, warm. I would recommend using organic bones. If you are making the broth for health reasons-to help arthritis, digestion, etc. The bones from any butcher may have been antibiotics or worse in them. I also used water from my Brita filter so as not to get any unwanted lead that could possibly in the water. Just a suggestion. Good luck and good health . This is hard to find in South London. I’m going round butchers to ask whether they sell organic meat. Morrisions told mewhat they have is ‘farm assurred’ meat, that because of the way , animals can’e be grazing all year. so its mostly farm raised. I think wha I wanted to know was whether the meat is organic i.e grass fed animals but I still am not sure. Brita filters are very minimal in the substances they filter. Compare Pur and some of the other other filters. You’ll be surprised. Hello! I’m finally cooking my first batch of bone broth after hearing about the benefits of it from my best friend. She advised to use raw chicken wings or drumsticks and only organic. I live in the UK too and found that certain Waitrose stores sell organic wings/drumsticks. (Chicken wings are much cheaper than the drumsticks). I used this receipe as a guide and added fresh turmeric, fennel to the mix as well. 4 hours in and aiming for 30 in my slowcooker. Wish me luck! Good luck Ingrid! I’d love to hear back on how it worked for you! Can it be canned for storage? Hi Tracy – I have only ever frozen my broth. But, you can definitely can too! Here’s a great article on how to do so. Hi Toyo, I’m in the UK too. I’ve just ordered organic chicken carcasses and organic beef bones from https://www.coombefarmorganic.co.uk They also sell chicken feet which are supposed to be very good too! Erin, do you use the tallow, or should I just throw everything away after cooking? Thank you for your articles, live it! Hi Virginia – I just toss everything after the cooking process. Everything is pretty “spent” after that long cooking time. You can save the tallow to make soap. Should you mix the bones or keep separate ….like all beef or All chicken? Hi Marsha – Great question. You can use any combination that you would like! This recipe sounds great, I’m looking forward to trying it. What benefits do the eggs shells have? Hi Teresa – It’s said that the egg shells help to add calcium to the broth. Hi..what herbs or roots would you recommend? what about a seeded jalapeño? Turmeric? Bay leaves? Parsley? Hi Lorie – You can use whatever herbs you like the best! A seeded jalapeno should add some good heat and interest to the broth – I’ve been meaning to try that combination. Bay leaves would be amazing! I almost always have some parsley in my bag of frozen vegetable scraps, so that’s usually thrown into my version. Hope this helps! Have fun experimenting!!! Should the bones be thawed or can you use frozen bones? Hi Christy – It is perfectly OK to use frozen bones. Just be sure that they have sufficient time to cook so that all the nutrients will be released. This is great!!! I have pets, could they benefit from this broth also? Hi there. Bone broth is great for pets too. Just be sure that you’re not using any ingredients that are detrimental to their health, like onions and garlic. I always freeze the broth that I can’t fit in jars in an ice cube tray and give them to my dog as a treat. One caveat – now he turns his nose up at plain old ice cubes! What a great idea Ramona – I’m sure my dog would love that too! Hi Lynn: Sometimes it’s difficult to get all the fat removed. I’ve found that it helps to let the broth cool in the refrigerator. The fat will solidify and rise to the top, then just skim it off with a spoon. I hope this helps! Will skimming the fat off the top also remove the gelatin layer? I find that the gelatin remains, it tends to be disbursed throughout the soup. I’m making my first batch today. However I have a whole chicken. Do I take the meat off when it’s done and let the bones cook for 24hrs? Hi Sandra – That sounds like exactly what I would do! Go ahead and set the meat aside for another recipe, or just throw it into your bone broth when it has finished cooking. Hope this helps! We had a show pig butchered and somehow ended up with head in the freezer. Is there some way to use that to make bone broth? Hi Sunny – I haven’t yet tried that, but I think it would work. Here’s a post I found on making pig’s head soup. thanks for this post! I got a kick out of reading the questions (2 garlic cloves or 3??) … did no one else grow up with a stock pot on the stove all winter?? No recipe needed guys, just clean out the fridge! You are SO welcome Grace – Thanks for stopping by! Why are you even reading this recipe then? You said that this should produce about 4 quarts of broth. After cooking it for 48 hours I ended up with about one and a half quarts. Should I be adding water as it cooks to keep it from condensing too much? Hi Charli – You can definitely add water during the cooking process if it’s condensing quite a bit. The amount of broth that you get will vary based on how full your crockpot is with bones and vegetable scraps as well. Hope this helps! Of course – Enjoy Monica! I just bought a book off amazon called Brodo. It’s a bone broth book from a guru in NYC. You’d love it! I have a bag of bones in my freezer right now ready to simmer. Do you freeze in mason jars? I’m concerned about them cracking. I bought the wide mouth ones in hopes that it will prevent breakage. Hi Jennifer – When freezing, definitely leave at least an inch of empty space, otherwise the jars will crack. I freeze mine in mason jars all the time and it is just fine this way. Enjoy! Your recipe sounds amazing, but I am cooking for one and my freezer is full. Instead of freezing, can this be canned in a pressure canner? Hi Donna – Yes! You could definitely can this too. Thank you for sharing. I really love drinking bone broth. I’ve ben drinking Au Bon Broth and I like it so far because of how it helped me with my sleeping problems. After cooking the whole chicken, I pick the meat off the bones and then I strain. Instead of discarding, I put it in the food processor then freeze the “mush” and use it as “filler” for other meals. Hi I’m wondering if you can use deer bones? Its almost hunting season and these bones would be organic per say. Hi Sandy – I’ve never made venison broth myself, but I think it would be great. There should be no issues with using deer bones. Hi Sandy, I use deer bones. I never put chemicals on my property and joins Fed. parkway. So I consider them grass fed and organic. For those who do not know about deer…they are very low fat, very lean. They won’t eat anything that is not good for them. They eat only grass and grains. Venison is a very healthy meat to consume. I have the butcher cut the neck into several pieces and keep the bones, such as ribs etc. This is what I add to my broth with organic beef bones that have been cut into about 2 inch pieces. I throw everything else in like the egg shells, celery, carrots, garlic, parsley and just everything. It tastes GREAT! I have my slow cooker going as I type this. Coming up to 18 hrs. This is my first time. Acupuncturist told me to consume bone broth due to not sleeping, poor concentration etc. I am excited to see how I feel after drinking the broth. I got an organic chicken but the bones did not fill the slow cooker. Smaller chicken. Hopefully the ratio of water to bones will be ok. I think that you will be great regardless Theresa! It may not be as thick with fewer bones, but you will still get some great health benefits from the bone broth. I hope you enjoy! Hi my doctor got me into cooking bone broth. She told me to buy always organic and buy a whole organic chicken and after 8 hours on low to take the meat off the bones for the freezer. Continue to cook the bones and veggies for at least another 24-36 hours and also add more filtered water. I also use Himalayan pink salt! Sounds great Cathryn – I’m definitely reading more and more that organic is important for those bones. I’m going to work on revising the recipe. I’ve read through the comments and several sites to see–wouldn’t it matter a lot that these bones be organic?? . Animals store the antibiotics and everything else given them in their fat and sinews . I would think we’d be getting a super concentrated amount of bad stuff in this bone broth. And yet it’s very hard to find organic beef with bones, chicken a little easier. I want to do this but can’t get over thinking about the hidden stuff. Yes Peggy – I think it is definitely best to use organic bones. Thanks so much for pointing out this helpful information. I did 72 hours in the crock pot on low and it burned! It was very bitter, and think we’ll just throw it out 🙁 I guess I’ll have to try again and do much less time? Hi Jill… Hmmm. I’m not quite sure what happened. Make sure that you have enough liquid in there and yes, maybe try just giving it 24 hours? It sounds like your crock pot may cook hotter than most. I hope this helps! I have a small 2 qts crock pot . I left it in low for 72 hs. My broth came out really dark. I made it with chicken meat and bones. the veggies were really dark at the end of the process, like burnt and everything looks brownish. Is that normal ? I don’t like the taste too much but I will drink it. Next time I will try with cow bones. Hi! I’ve noticed that the color of my broth comes out differently every time for some reason… Also, it seems that some crockpots are cooking at a higher temperature than others. I would suggest keeping an eye on it and giving it a taste after 36 hours. Hope this helps! try just cooking the meat and bones first. Then take the meat off the bones when meat is done and put into the fridge don’t put the vegetables in right away. Cook bones around the 72 hours mark Add the vegetables let cook when soft puree them into the broth and strain. For a meal with the broth, add the meat back in and any vegetables you may want to eat with the meat. I hope this helps. Do you need to get ALL the meat off the bones before starting the process or will straining take care of the meat? The straining will take care of that – No worries to start with meat on the bones. 1. Ho much water should you actually put in? I just made this recipe and added about two – three cups but didn’t get a frothy too so thinking I might have added too much water from the jump. 2. It says ler it come to a boil first. I didn’t do hat properly either, I don’t believe. Should the slow cooker be out on high at first and then set to low after? I would recommend doing some research with recent, up to date info on garlic for pets/ dogs in particular. It’s now widely accepted and used in many pet formulas (particularly for flea control) and has been debunked as toxic by many reliable sources if used in normal, reasonable amounts. It’s not the same as onions. In all the research I’ve done they are unanimously considered toxic. Very interesting, don’t think I ever saw or read about this before, thanks for the idea! Hi Sharon – They’re going to be quite mushy, if they’re even still in solid form. They probably won’t be edible. Thank you for this recipe! I made my own bone broth for the first time this week and it was delicious. However, I accidentally left it out overnight after I turned the slow cooker off. It was out on the counter for about 10 hours from when I turned the slow cooker off last night before I put it in the fridge this morning. Is it trash now? Yes – I would not eat it Shilo. Bummer!!! To distinguish between the fat layer and gelatin … will the fat layer be more opaque and white? Is it for health/dieting reasons to remove fat or is it safe to keep and consume the fat layer? Hi Haley – The opaque, white layer will be the fat. You can definitely remove that if you prefer. I normally will leave it if there is not too much of it. Does this help get rid of wrinkles? Particularly deeper ones? For example, the line that can form above the nose and in between the eyes? I guess I’m asking… besides the health benefits, is it turkey better than Botox? Hello, I had a question. If we use cooked bone scraps, do they need to be rinsed before we actually cook them in the broth? Hi Michelle – No need to rinse them. I am so happy to have found this recipe. I am having gastric sleeve surgery this month and it is necessary to have clear broth after recovery. Thank you for sharing. I will be making a bunch of this in advance. You are welcome Angela – Best wishes for a speedy recovery! Can I add a a stock cube in place of extra salt? Have you ever used a ham bone? I froze the bone from our Christmas ham, and thought I could use that with zny others that we save in the freezer. Can’t wait to try this! A turkey carcass would work great too, right? I think that either of those would be amazing as a broth Jacque! This bone broth looks absolutely fantastic. Beautiful photos, too. I look forward to trying this. Definitely I will prep it on the weekend for my family. Thanks so much Jill – I hope you enjoy it! Hello There. We are a deer hunting family. Would deel bones be acceptable as well for bone broth? Thanks for the inspiration and information. This is my first time making beef broth and it came out a beautiful dark brown! It seems that I have a lot of oil floating on top of my broth in the jars. I. Think it may be from roasting the bones with a coating of olive oil. Will the fat harden underneath it so I can easily remove it? Any suggestions? Hi Patricia – Normally my fat will harden after the broth chills. Then I’ll remove that and enjoy the broth. Cheers! After straining the broth, I pour it into metal bowls and let it sit in fridge 1-2 days. Then I skim and discard the entire layer of solid fat that forms, scooping up stray bits of it with a hand-held strainer, so it’s perfectly clear and then pour into glass containers for the freezer. I’m probably discarding collagen plus fat but it’s all in one layer and I can’t possibly tell the difference so it all goes in the trash. I use it for cooking grains, soup base, and adding it to food before reheating (using the steam function on the Instant Pot). I discovered this works incredibly well in the Instapot if you want to try an alternative to the slow cooker. It cuts the cooking time to about 45 min, I also think the pressure cooking effect brings out more flavor. Thanks so much for the recipe. It does! I’ll be putting out an Instant Pot version soon! This is Fiona. I am a huge fan of your work and would love to include you in my round up post. What is the greatest health benefit that bone broth has given you? What do you do with the bones after your broth is fully cooked? Hi Laura – I just toss them in the trash. They’re pretty much spent after all that cooking time. Any idea if digestive issues associated with eating beef, would be the same with a beef bone broth? I have a terrible time digesting red meat so I usually try to avoid it, wondering if the bone broth would have the same effects? Through my research it seems like beef bones and seafood collagen are the most effective but beef seams easiest to work with. I totally forgot to add apple cider vinegar. We’re on 18 hours. Can I add now and let cook continue for another 12 hours? 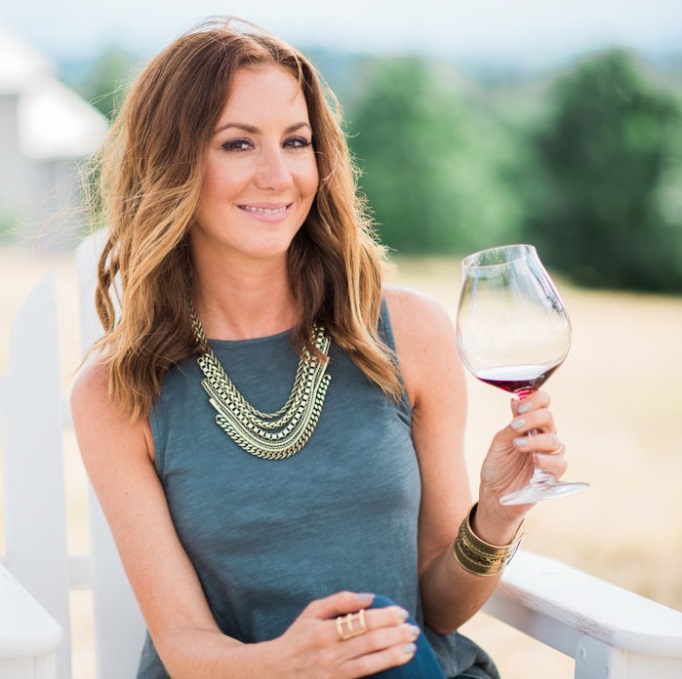 Hi Jeannie – I would just skip the ACV this time. It will still be great (and great for you), but it may not have pulled all the nutrients. You’ll still get great benefits from this batch. Hi there! Thanks for sharing! Can u tell me what size slow cooker u used? And how many cups of broth do u end up with for this recipe? Thanks so much! Hi Crystal – I use a 6-quart slow cooker and end up with about 9-cups of broth. What is the best way to store bone broth? I see most pictures of it in Ball Jars. How long can it be stored? 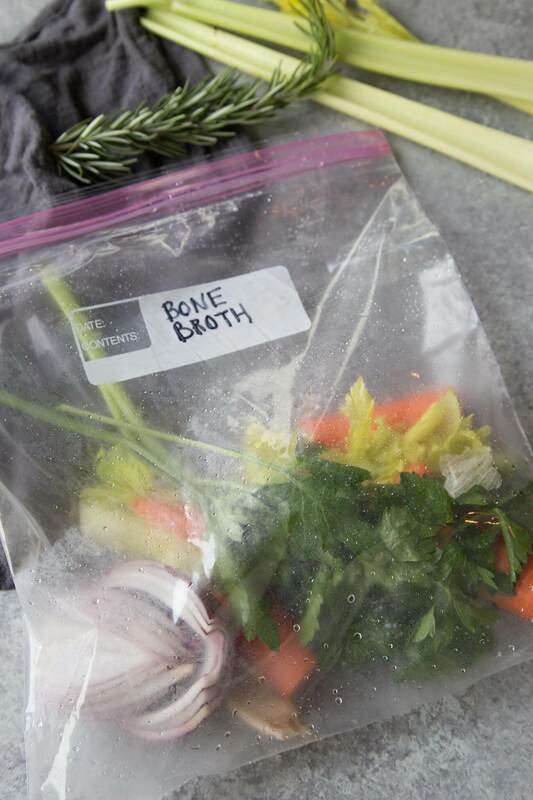 Hi Patti – You can store the bone broth in the freezer for up to 3 months. Just be sure that you leave about an inch of free room in the top of the jar to account for expansion during freezing. Hope this helps! Hi Laura – That’s definitely odd that all the liquid evaporated. Adding additional water should not hurt it. Perhaps it is cooking at too high a temperature? You may also want to be sure that the lid is set on properly. Hope this helps! I have been making broth for years in my crock pot. So much faster and easier. I have 2 plastic containers with a lid in the freezer and I just add bones and veggie parts as I cook. When they are full I place all in my crock pots and cook for 2-3 days. After I drain into a super large pot and let cool I strain the fat off the top. I then heat back up and can according to USDA recommendations. This way I always have tons of pints of broth to either heat up or use in cooking. Why skim off the fat? Isn’t this the “good” kind of fat? Looks easy enough and yummy! I don’t see any protein on the Ntrition Facts chart though…? I thought bone broth had collagen- which is protein…??? This recipe looks great. Quick question, my slow cooker can only cook for up to 8 hours max on low. I was wondering if I can “re-cook” the broth after the 8 hours is up for another 8 hours? You can definitely do that Sheela! This bone broth definitely looks yummy! I love your recipe cuz it contains healthy ingredients! Thanks, Erin a lot for sharing! You’re so welcome Bella – Thanks for stopping by! How will I know when it’s done? What should the texture of the bones be like? Going to try this today. Hi Tania – Your bone broth should be deep golden in color. The aroma should let you know as well. are the bones from cooked meat or raw meat? Also is the egg shell from boiled eggs or uncooked? Hi Austin – I use bones from cooked meat, but you can also use raw bones. The cooked bones tend to lend more flavor, I’ve found. The egg shells can be either cooked or uncooked as well. I’m in the process of making this for the first time! It’s been about 18 hours in the crockpot on low and I noticed the broth is beginning to disintegrate. Is that normal? Hi Erica – Do you mean the bones? It should be OK, but I would maybe stop the cooking process now if they’ve cooked down that much. Hope that helps! I just heard about Bone Broth on The Chew a couple weeks ago. This is so interesting to me. I have bought some in the store. But now will make my own. I will start saving all my meat bones and vegie scraps. But in the meantime theres a farm very close to me that sell chicken feet. I will use those at this time as I heard and read it great broth if you use the feet. I grew up on on farm over 50 yrs ago. N If my grandma only knew what chicken feet would be used for. Can you use eggshells from hardboiled eggs or should they be fresh eggshells like from breakfast? Hi Jessica – Either will work! So I made bone broth for the first time & the recipe said to leave it in the crock pot for 24-48 hours on the highest setting. It was in there for about 26 hours & when I opened it up, there was almost no liquid left in it. HELP! What went wrong? Can one make this Bone Broth using raw marrow bones or must they be roasted/braised beforehand as the recipe says? I want to start off using fresh everything and later move to using scraps. Hi Richard – You can use raw bones but the flavor of the broth may not be as deep and developed. I have been having stomach issues and looked on line and bone beef broth was recommended. I made this as directed for 48 hours. Removed from my slow cooker and strained, then placed in an ice water bath. I was surprised how fast the fat solidified and the broth gelled up. I will make this again…..the only problem was smelling it for 2 days while it cooked……kept waking me up because it smelled so good! Thanks for sharing. Of course Lynette! I’m so happy you enjoyed the recipe! I would like to try this recipe, but you say it has to be cooking for 3 day. I hope that this is wrong and I don’t have to cook this recipe for 3 hours. There is no way, that I can have something cooking for 3 days. Hi! Just curious, in the recipe it says to remove the fat from the broth after it has gelatinized. I’ve been told before that the gelatinized far works to seal the bottle and Kerri’s the broth fresh- as long as you used sterile bottles- is the removal more of a preference? I ‘ve made homemade broth before and dumped everything, gel fat included- into the soup or whatever I am making with the broth… Is that bad? Nope – It’s definitely just a personal preference Melissa! I roast my bones for 40 minutes in a 400 degree oven then add vegetables, etc to roasting bones for another 40 minutes then put them in Ina stock pot and add water 2 inches above bones, etc. Bring to boil then simmer. Only simmered for 8 hours. I’ll see what it’s like tomorrow morning. My first time making this. I am excited to try this! Do you happen to know the amount of protein per serving? Hi, I have problems getting chicken feet here in my rural scotland as they are sent to china. So could I use pheasant feet instead? I made mine, but used the entire piece of meat with bone and meat attached. (I used short ribs) Does this still give you the same benefits with the meat attached? The broth is still tasty! I am trying chicken bone broth for the first time in a slow cooker. There was some meat left on the bones. Will this detract from the cooking process extracting full nutrients from the bones? Hi Sandra – No problem there! You can definitely leave some meat on the bones. I was wondering if after I de-bone my chicken after making chicken soup can I put those bones back into a slow cooker and make bone broth? Can you freeze the broth to use later on soups? Definitely – I love to freeze my bone broth! I just received my Oster 22-quart oven roaster. Temps go from 150-450. Got this mainly for bone broth and tomato products for canning. I will simmer at 208 degrees. Can’t wait for the results. Hi Geneva – They go in at the beginning. I always have bone broth in my freezer to us as stock for rice or quinoa instead of using water to boil them. Usually I will put a lot of celery in my broth too for health benefits. Thank you Erin for the recipe. Are you suppose to use organic bones? And I was thinking of roasting them before boiling them, extra flavour. Hi Tina – Organic is preferred, but either will work! There’s no information in the nutrition facts about the amount of protein…surely there is protein? Hi Erin, I am new to this so forgive me if I sound ignorant. I put a whole chicken in the slow cooker, I cooked about 8 hours slow. I removed the meat when it was done to use in a recipe, leaving me with broth and bones. I want to know if I can use this as my water and add the veggies, more bones and vinegar and just cook longer to get a bone rich broth or is there something I’m missing? My goal is a healthier eating habit for me and my husband who are trying to lose weight and stay well nurished. Any help would be greatly appreciated. Hi Jackie – Your strategy sounds perfect and exactly how I would do it! Happy Holidays. hi, I have just started making bone broth and am having fun playing around with different bones for the broth , seasonings , etc. But I have a question , after making several batches of broth with the bones , the bones just fall apart in my hand . I had read one article about running these bones through a blender and then adding them back to the broth for added nutrients …. any thoughts ? after making this broth do you just drink it ? or, use it for soup, flavoring ? Hi Susie – I drink it straight. Or, I’ll add it whenever I would add broth/stock in a recipe. I love to mix in some miso with it too for even more flavor if I’m enjoying it straight. Do you know about how many grams of protein per serving ? If using a pasture raised animal for your bone source, don’t bother to skim off the fat. It’s actually good for you! Lots of omega-3s. Or if you want, skim it and cook with it. How do I know I’m not scooping out collagen when I scoop the fat out? My first time making bone broth with beef bones from my butcher. Mine is very runny not gelatinous at all once it was completely cooled and I removed the fat. I cooked for about 24hrs. Should I have cooked for longer? have I added too much water? Does it matter what kind of bones I use? Hi Emma – It sounds like you may have added too much water. No worries though! You’ll still get some great benefits from the broth. Thanks Erin. I will try again with a bit less water. I had another look today after the broth had been in the fridge overnight and it seems to have thickened up a bit. Hi Alissa – It just gets better the longer you cook it. 18 hours is great, but if you have more time – go for it! We do not have a slow cooker but a large cast iron pot. I’m making our first pot of broth according to your recipe and I’m wondering how long to cook it on the stove top. I added the egg shells to everything else you suggested and we are looking forward to our 1st drink of broth. I’m making our 1st pot of broth according to your recipe, w/egg shells. We do not have a slow cooker so I’m making it in a large cast iron pot on the stove top. How long should I let it simmer? I would let it simmer for 8-12 hours. Hope that helps! Hello Erin, What is the protein ratio? I’m very allergic to Apple Cider Vinegar. Is there another acid I could use such as regular vinegar? I used Yak bones (from a quality local farm) and roasted them and the vegetables in the oven prior to putting them in the slow cooker on low for 67hrs. Unfortunately, I had to add water twice – maybe the seal on crockpot lid isn’t fitting properly? The taste was super deep, like a liquid pot roast and it has literally done wonders for my gut! Hi there, After I saw this post, I asked my farmer for chicken and beef bones. I noticed what she gave me were chicken backs. They have meat on them. Is it ok to do this with meaty bones?? If so, do i eat the meat after or will it be weird and gross?? Hi Monica. You can definitely use bones with meat on them. Unfortunately, the meat is generally super dry and not very tender after the slow cooker process though. Why would u toss the delicious fat? I make my broth with free range chicken feet. I also add a bit of thyme and rosemary. I cook my broth until bit dark in color. It makes a condensed broth that goes a long way as I consume everyday. Nice post. I would add that the amount of time is important relative to the size of your bones. A beef knuckle is large, and I usually cook something like that for at least 12-24 hours. Chicken feet, which are a great way to get collagen in poultry stock, which, as you mention is generally gelatin-deficient, can be ready in about 4-8 hours. Requesting tendons from a butcher is also a good way to get extra collagen, either that, or cooking the head of an animal, like a lamb, which will taste more mild than pork. I find cooking stock for longer than 24 hours can result in over-reduced stock, but that’s just my preference. Continual reducing, especially with the lid removed is a great way to make homemade glace de viande though.